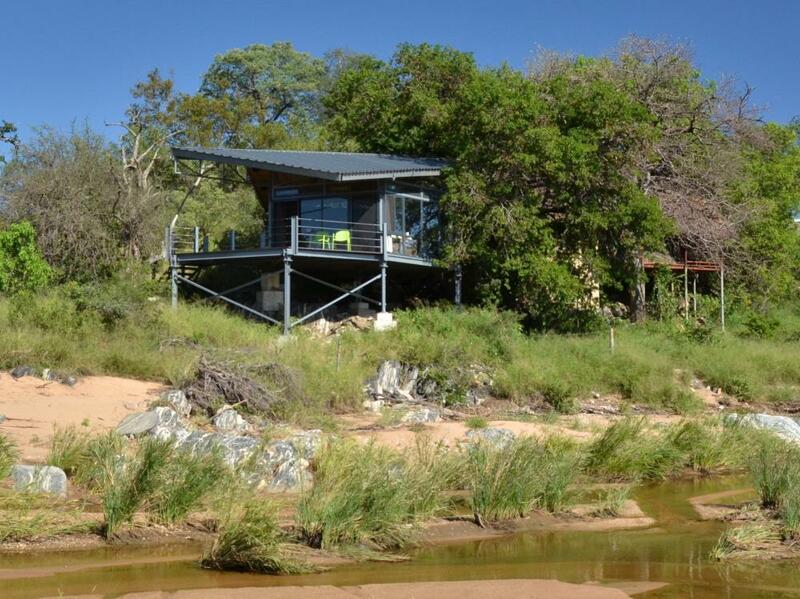 Strikingly contemporary styling and great views from its location perched over a riverbed are the key stand-outs of this simple and reasonably priced lodge. Stunning views of the river bed below from the public areas and your room – you can literally lie on your bed relaxing whilst watching the animals below! The huge Balule Reserve is open to the greater Kruger National Park which means that game viewing possibilities are considerable if perhaps not quite on a par with the better known private reserves further south like the Sabi Sand. Ironically it was the lodge’s position perched over the (usually dry) Mohlabetsi riverbed that led to this lodge’s rebirth. Previously a very simple tented camp called Drifters, it was destroyed by a serious flash flood a few years ago. With the opportunity to rebuild, the chance was taken to completely change the style of the lodge and what has emerged is altogether much more stylish and contemporary. 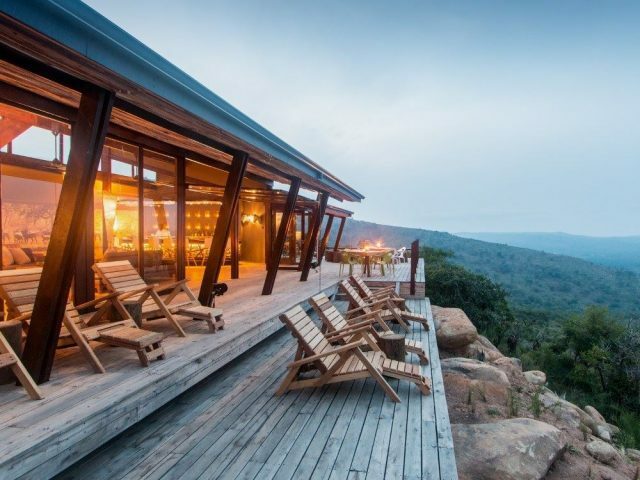 Greenfire Game Lodge is fairly isolated: sitting inside the 50 000 hectares that compose the Balule Nature Reserve, it lies in a privately-owned, completely natural environment. Rebuilt in a stark contrast to the previous tented camp, Greenfire does away with the old canvas and flaps to usher in a new style that is both fairly unusual and strikingly contemporary. The lodge itself looks out over a riverbed: a truly fantastic scenic location that will take your breath away each time you look out across the banks. Accommodating a maximum of just 18 guests at once, Greenfire comprises nine “luxury units”, each fully equipped with their own en-suite bathrooms. Plenty of glass, modern fittings and style are the central thesis of the design, with stonework laid into the walls complemented by softer touches of carpeting and plush sofas. This ethos is also espoused in the obvious care they’ve taken to maximise light in the rooms. Wide glass doors and windows let the sunshine pour in, while softer tones of greys (along with metalwork chandeliers, steel fireplaces and wickerwork large couches) make sure it’s not too stark an effect. Unusually only twin beds are available and you also need to be aware that there’s no air-con either (although with fans and wide opening glass doors and windows it’s always possible to get a comforting breeze going. But the best part about the rooms has to be their clever placement. Each one is carefully hidden from each other, so that the view from your private viewing deck on each room isn’t spoiled. 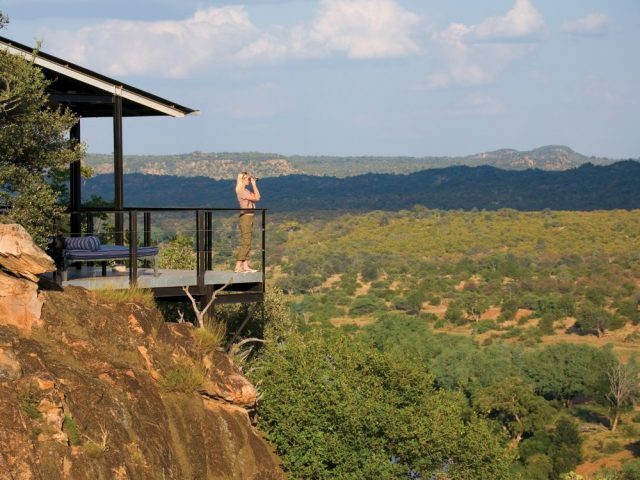 And it is the views over the river bed that really makes the Greenfire experience: in the central lodge, a treetop lookout over the riverbed allows for panoramic views of the surrounding bushveld, and even from the deck of the sparkling pool you look down directly on the river below. The same contemporary style is also evident in the main dining/lounge/bar area – this also boasts the massive glass areas, high ceilings and aluminium framework that make Greenfire so different to the usual thatch and wood traditional game lodge styling. Wood ceilings, stone clad feature walls and a warming fireplace keep things from becoming cold and clinical. 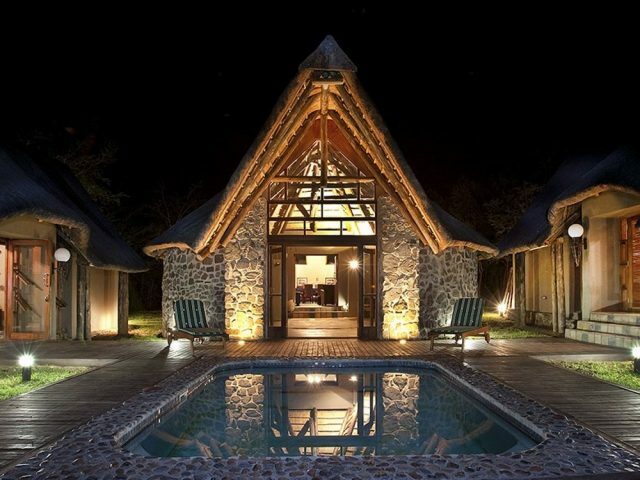 Obviously the very modern look is not going to appeal to everyone, so have a good look at all the lodge pics before you decide to head here on safari. Whilst the lodge itself is quite different, the game drive experience is comfortingly traditional with twice daily drives through the 50 000 hectare expanse of the Balule reserve. Balule is adjacent and open to the greater Kruger National Park, which is arguably the best and most widely-known game reserve in the world in terms of wildlife viewing, so you get the game but with much less traffic to contend with than the public reserve. The Balule does consist of a lot of smaller plots so can feel a bit more developed and less pristine than some of the other private reserves to its south, but the location of Greenfire is relatively isolated within the reserve. The ranger team is professional and knowledgeable, and you should hopefully see most of the Big Five during the course of a 2 or 3 night stay. 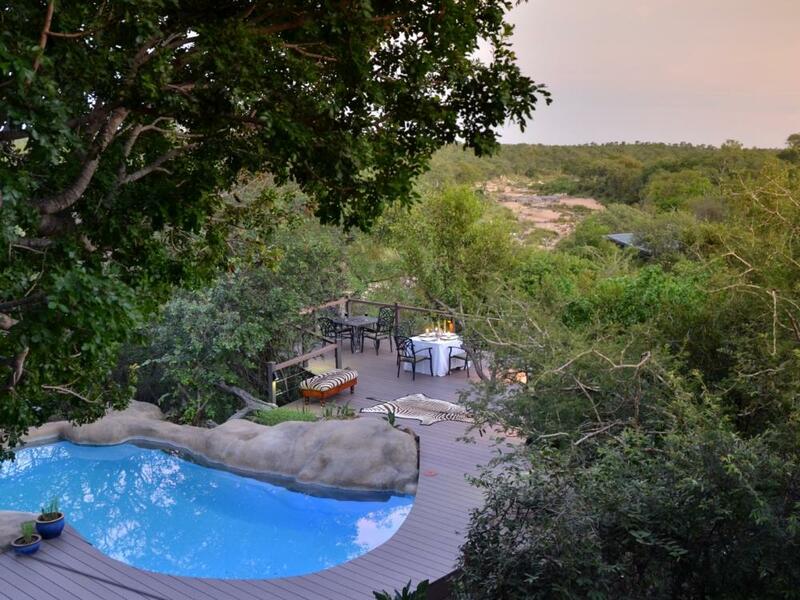 As a very well-priced option relative to most of its lodge rivals, it’s probably fair to say that Greenfire isn’t going to provide the overt luxury and almost overly attentive service exhibited by many of the much more expensive lodge options that proliferate in the greater Kruger area. Consider it in terms of its unique style, superb location and low price though and Greenfire definitely merits your consideration. Children 8 years and older are accepted at the lodge. Children will be allowed on game drives at the sole discretion of the ranger. One child between the ages of 8 and 11 years can share with the parents in a room and will be charged at 60% of the adult sharing rate. Children 12 years and older will be considered as adults and will have to go into their own rooms and charged the full adult rate.